As the humanitarian crisis escalates in the war-torn Libya, more than 120 people have been killed since a Libyan military commander launched an assault on the capital 10 days ago, the U.N. health agency said Sunday. Some 121 people have been killed in the fighting and another 561 have been wounded, the World Health Organization (WHO) said. The agency did not specify whether they were fighters or civilians. U.N. envoy Ghassan Salame said a school was bombed in the town of Ain Zara, around 15 kilometers (9 miles) southeast of Tripoli, without saying who was responsible. 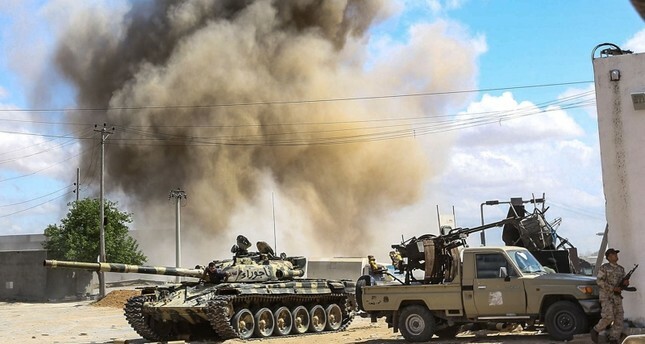 Both sides have carried our airstrikes on the town, and a spokesman for the self-styled Libyan National Army (LNA) led by Gen. Khalifa Haftar said it has stepped up airstrikes on its rivals in the past two days. Egyptian President Abdel-Fattah el-Sissi met Sunday with Haftar, whose forces are fighting for control of the capital Tripoli, state media reported. They "are discussing the latest developments in Libya" at the presidential palace in Cairo, state newspaper Al Ahram said. El-Sissi has been an ardent supporter of Haftar's forces, which control swathes of eastern Libya and launched an offensive on April 4 to take the capital. Haftar's push on Tripoli in Libya's northwest is the latest turn in a cycle of factional violence and chaos dating back to the ouster of former President Moammar Gadhafi in 2011 and NATO's aerial oprations. Libya has remained dogged by turmoil since 2011 when a NATO-backed uprising led to the ouster and death of former President Gadhafi after more than four decades in power. Since then, Libya's stark political divisions have yielded two rival seats of power, one in Tobruk and another in Tripoli and a host of heavily armed militia groups. The military push by Haftar's LNA, allied with a parallel eastern administration based in Benghazi, marked a dangerous escalation of a power struggle that has dragged on since the overthrow of former leader Gadhafi. Haftar is not recognized by the international community, as the elected parliament of the country is centered in Tripoli. However, Haftar, with financial and political support of certain countries, including some Gulf states, has appeared as an influential actor in the war-torn country.